This secure Credit Card Sleeve offers RFID (radio frequency identification) protection from ID theft and credit card hackers. Savvy electronic thieves now discreetly use RFID readers to scan and copy the financial and ID information from your cards while they are right in YOUR wallet, or seemingly from out of the air while you fill up your tank at the gas pump. 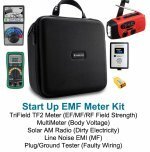 Order Today and it Ships Today Free. Size 3 1/4" x 3 1/2" . 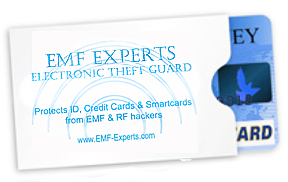 This security card is radio-frequency-scan safe tested by our EMF Experts RF testing laboratory. Durable yet slim and lightweight this sleeve is very easy to use, simply slide the card into the sleeve and put it your wallet. This type of Radio Frequency non penetrable, Laminated Metal Core Secure Sleeve for ID security, is approved for protective use by the US Government. Credit Card Sleeves or RFID Blocking Holders are excellent Protection for Contactless Payment Wallet Cards and for protecting magnetic strip function. 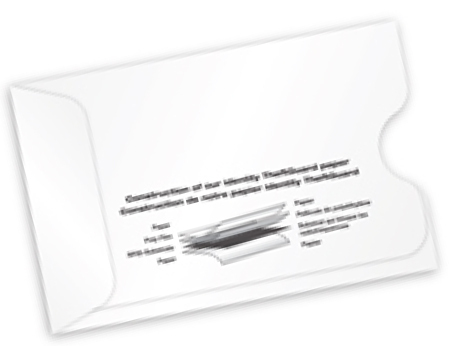 Protects Against Identity Theft And Fraud Via Unauthorized RFID And NFC Scans. also known as Digital Skimming Or Electronic Pickpocketing. Why are credit card sleeves useful? The equipment, which makes credit cards so handy, is also what causes them to be easily manipulated by crooks. 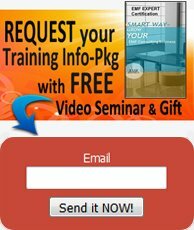 Many credit cards contain a sort of microchip that allows them to be read by the machines in stores, gas stations, etc., and criminals have figured out how to use this technology to their advantage by creating gadgets that can steal information from the microchip right from your pocket. The chip includes everything they need to use your card, such as your name and the credit card expiration date. Once someone steals your credit card information, they can quickly use it to make charges, open new accounts in your name, and destroy the good credit score you have worked so hard to build. Since your actual credit card was not lost or stolen and you may not even have taken it out of your wallet at any time, all this can happen without you even realizing you have been compromised. According to Engadget, which provides reviews of technology products, this device, can be obtained cheaply by anyone. The criminals buy a reader similar to those you see in stores that works like the radar guns used by law enforcement. It emits a radio signal, which bounces off your credit card, sending your personal information back to the thief. They can be connected to any ordinary technology, like a portable computer, and can be activated while the person is behind you so you would not notice someone using it. Unlike the traditional burglar of the past who would bump into you to pick your pocket, today’s sophisticated robbers do not have to come into physical contact with you. With this type of deception, it is more important than ever to stay one-step ahead of the bad guys by using any helpful tools that are available. Although the new microchip technology makes it easier for lawbreakers to commit identity theft, it is also more reliable and compatible than the widely used magnetic strip. You see it mainly in places where you only need to pass the card over a light or reader, making them more preferred by both businesses and consumers because it eliminates the need to sign a receipt or type in a personal identification number, which can easily be stolen or copied. Therefore, credit card companies are planning to increase their use instead of decreasing production. When are Credit Card Sleeves Used? Most of us carry around at least one credit or debit card every day. It is almost impossible to completely isolate yourself from everyone in town. You can find individual cardholders and even wallets to guard all your cards. You can get the RFID blocking sleeves or the more general non-RFID sleeves that help protect the magnetic strip from harm or scratches. These are important because if the strip is damaged, the card becomes unreadable when swiped through a machine. Are there any downsides to the new RFID technology? These devices are not new. They have been used for many years to track everything from store merchandise to endangered animals before being used in the new smart credit cards. Some people are not fans of the RFID credit cards because it can potentially allow people or companies to track your location. Credit cards sleeves prevent this because the cards cannot be read while inside. More information about RFID technology can be found from the RFID Journal, a source for news and opinions regarding these applications.